Rosaline D. "Rose" Feldpausch age 95 of Fowler, MI, passed away Friday, July 27, 2018 at Sparrow Clinton Hospital, St. Johns, MI. A Mass of Christian Burial will be held at Most Holy Trinity Catholic Church, Fowler, MI on Wednesday, August 1, 2018 at 10:30 A.M., with Rev. Fr. Dennis Howard officiating. Burial will take place at Most Holy Trinity Cemetery, Fowler MI. Visitation will be held on Tuesday, July 31, 2018 from 4:00-8:00 P.M. at Smith Family Funeral Homes - Goerge Chapel, Fowler, MI. A Rosary will be prayed on Tuesday at 8:00 P.M.
Rose was born in Westphalia, MI on July 13, 1923 the daughter of John and Ida (Thome) Smith. Rose married Lester Feldpausch on April 10, 1944 in Westphalia, MI. They had a double wedding where Rose and her twin sister, Pauline married Lester and his brother Carl. Lester passed away on December 22, 2016. Rose resided most of her life in Fowler. Rose made many quilts for her family. She loved to fish and play cards with her Smith family. Rose also enjoyed going to the casino. She will be remembered for her delicious cookies, especially her molasses cookies. Rose was a member of Most Holy Trinity Catholic Church Fowler, MI. 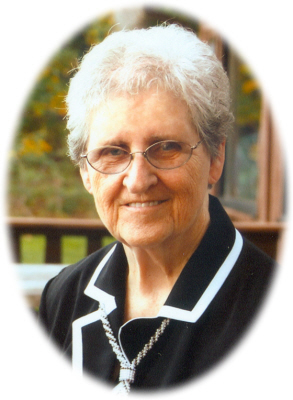 She is survived by 2 sons: Brian and Joyce Feldpausch of Fowler, MI; Dan and Diane Feldpausch of St. Johns, MI; 3 daughters: Judith and Lawrence Pierce of St. Johns, MI; Joyce and Richard Miller of Fowler, MI; LuAnn and Bob Doriot of Traverse City, MI; 11 grandchildren: Kurt Wright (Becky Sumey), Christine Wright, Mindy (Eric) Voisinet, Klint (Holly) Feldpausch, Kacey (Jacki) Feldpausch, Dustin Feldpausch (Liz Manley), Devon Feldpausch (Lexi Schmitt), Traci (Brent) Kohagen, Emily (Josh) Rademacher, Lindsay (Mike) Williams, Holly (Bryan) White; 4 step-grandchildren: Rich (Romac) Western, Amy (Joe) Fegan, Bryan (Leah) Doriot, Joey (Dave) Turner; 11 great-grandchildren: Joe, Kate & Delaney Voisinet; Noah, Caleb & Ben Kohagen; Brynn & Brooks Feldpausch; Cash & Duke Feldpausch; and Pippi; step-great-grandchildren: Ben & Hattie Doriot; Amerett & Lyman Turner; Alex & Allison Fegan; Ava & Adian Western; 2 sisters: Adeline Feldpausch of St. Johns, MI; Agnes Schomisch of Fowler, MI; and sister-in-law Doris Klein of Fowler, MI. Rose was preceded in death by her parents, husband, 5 brothers and 4 sisters. Memorials may be made to Sparrow Hospice Services – for Clinton Home Hospice. Online condolences can be sent to www.smithfamilyfuneralhomes.com. The family is being served by Smith Family Funeral Homes - Goerge Chapel, Fowler, MI.